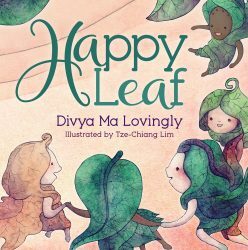 Happy Leaf is a story about the feelings we can have when we become friends with ourselves, other beings, and the nature that surrounds us. Gratitude breathes life into our day-to-day experiences. The unquenchable result? Love! Our heart opens up to the beauty of life and the love that is all around us in the form of the sun, birds, moon, trees, fish, rocks, and butterflies. Happy Leaf is never alone. She shows us how we can make a deep connection with all of life and nature. An inspiring story, complemented by captivating illustrations, takes its reader on a playful adventure that sparks the heart and imagination of children and awakens the inner child in readers of all ages. Divya Ma grew up Catholic in Manila, Philippines, and later became a yogic nun. She travelled in Bangkok, India, Jamaica, the United States, Mexico, and Canada, teaching meditation, yoga, and humanitarian services. She has been one of the pioneers in introducing yoga classes in U.S. public schools with preschoolers, elementary, and middle school students and teachers in the 1990s. Starting in 2000, she lived in a solar-powered yurt in the Ozark Mountains in Eureka Springs, Arkansas for about ten years. Presently, she lives with her spiritual partner, Gopala, in Wisconsin.